So in my time on this lovely home, we call Earth...I have made some observances of what happens around me. I tend to be fairly aware of my surroundings...granted, not when ice is involved. If there is ice within a 20 mile radius, I am certainly the one that will find it and not only do so through sight, but I will have my rear end, knee or entire being come face to face with the ice to be absolutely sure that it's there. I have fallen on ice THREE times since Christmas. I mean really?! But I digress...here are some brief observances from my recent experiences. Speaking of the little dear...OH what a handful. I promise to post again with more photos this month, but she's just too funny. Lipstick, tissue, you name it, she loves it. Her fur is so fine that it seems to matte very quickly. We had to have her shaved, quite a bit. She's very naked and she dislikes the cold ever more now, but Miss Olive is still the most adorable pup with her big brown eyes and pretty fur. 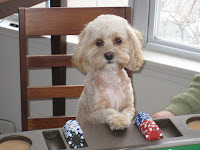 Unfortunately, most recently, Olive has discovered her love of poker. As the hubby finished setting up his poker table and chips last week for a game we hosted, Olive was intrigued. She decided to join in the game...well at least she wanted to anti up. Since she's underage, we did not let her gamble, but perhaps in a few years. I think blackjack will be more her game vs. poker, but we'll see. Enjoy the photos. Since my brief reprieve from a daily commute, I had forgotten how hysterical, fun, and annoying it can be. Obviously, it'd be great if we all lived on the Starship Enterprise and could be "beamed" to our location of choice, but we don't and commuting is always slightly tedious and a bit of a pain. Alas, it's a necessity and mine is fortunately not very long. However, I forgot how hysterical people are. That everyone thinks once their car door is closed no one can seem them - they pick their nose, they sing along to the radio, they talk on their phones and use their hands vehemently to explain their conversation to the person on the phone (because it does help them explain of course!) and my favorite one today - a guy in a car behind me was picking at his hair (or something in his hair) and licking it off his hand. Gross, yes, but is anyone else wondering what in the heck he was tasting?! I am very guilty of the "invisible in the car" mindset - I sing, I dance and I have fun...that is, unless I'm a passenger. If I'm a passenger, all bets are off and I'm likely sleeping. So if you see some crazy gal in a car buzz by you singing and having a good time, I ask that you smile and keep on licking your hair. I hate them. No, that's probably too harsh. I dislike them a lot and I usually don't understand them, which makes me like them even less that I may have originally! So my car broke yesterday. It acted like it was possessed and I had no prior warning. It wouldn't start - the lights flickered and the trunk lock kept clicking like it was on speed. The ghosts of cars past temporarily attacked the car - as if to remind my current wheels that they're paid off in less than six months. Therefore, you must be broken and expensive right now. Argh. The car is fine, but it would just be nice to have all mechanical things work with me more often. So something ramblings from me about things just going on around me. On to the next random thing. A crazy beginning to the month of February! My beloved Purdue Boilermakers turn out another winner in Drew Brees. I've always been a latent Saints fan, the whole God thing, loved the idea of New Orleans and thought it was great that Ditka went on to coach there too. Then they took on Drew Brees, even when his career was uncertain. And look what they got. Drew was the first quarterback I saw in one of my many visits to campus before I transferred from PUNC. He (and an awesome team and coach) took the Boilers to the Rose Bowl and on to a championship. A winner even then! Congrats to the Saints, I am sure the celebrating has not stopped and will go on long past Fat Tuesday next week - but fun times. And congrats to Mr. Brees and his family for all they have done for an amazing city. Maybe the hubby and I will make it there for a mini vacation sometime!! Enjoy Mardi Gras!! I, for one, am opting for many personal improvements (in addition to the resolution list - going very well, thank you for asking)...but the big one - less clumsy. I am going to work on being more coordinated and NOT injuring myself. My sweet pup and hubby decided to enjoy the weather on Tuesday night. There was an unexpected result...an emergency room visit. All is well, but what started out as a careful, but fun romp in the snow quickly turned into a display of my snow-skating abilities and keen skill in bouncing my skull off the (unshoveled and unsalted mind you) pavement! A small gash that of course bled like crazy, like all head wounds do, led to the ER. A thank you to the nurses and doctors that checked me out, cleaned me up and sent me home. And of course the awesome hubby for taking terrific care of me. I am now graced with a lovely egg on my head and have worn my hair in pigtails for the first time in my life to keep my hair out of the cut. And I've now spent the last three days with the worst hangover I've ever had and I haven't even had one drop to drink all week! The cruelty of it all, really.